This is a brand spanking new school age program that we are starting this quarter. It is on the first Thursday of each month, going through April. I am doing two school age programs a month this quarter. One will be the Start with Art series and the other will be STEAM focused. The kicker is, there is absolutely no registration. We shall see how it goes. At our library there are some programs that we use registration for because of limited budget/materials or limited space. Sometimes we have a full list and only a handful show up, and sometimes the opposite is true. So I am trying to be brave and test the waters of zero registration requirements. Pray for me. Anyways, here is our description that our patrons see on our events calender of the art program. "Kids are all about expressing themselves! Learn how some of the world's great artists have expressed their creativity and get a chance to "Be Your Own Great Artist." 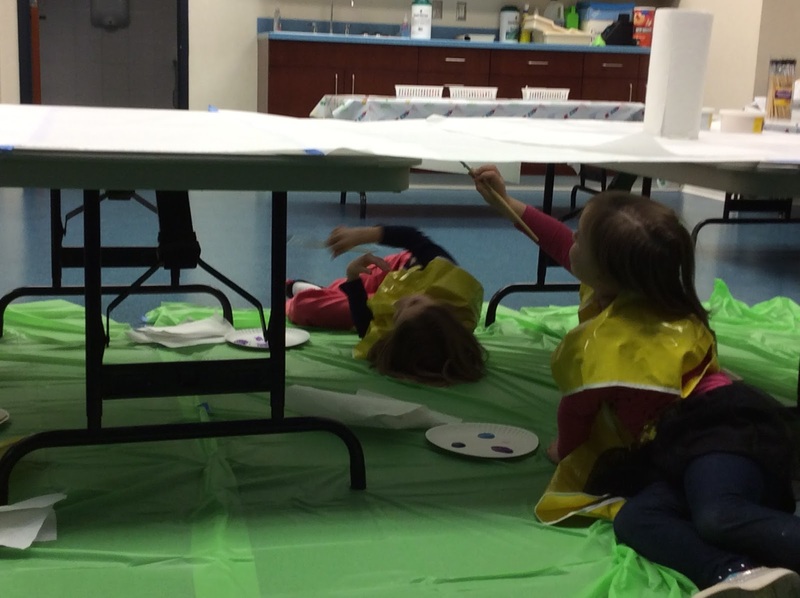 Children in grades K-2 are invited to experience the work of Matisse, Michelangelo, Frida Kahlo, and Jackson Pollock as they Start with Art at the library!" I briefly booktalked and passed around of the non-fiction titles we had on Michelangelo and the Renaissance time period, including a book of inventions. Next, I had some coloring pages with a few scenes from the chapel that they could color, playdough so they could work on their sculpting skills, and they also got to paint like Michelangelo. 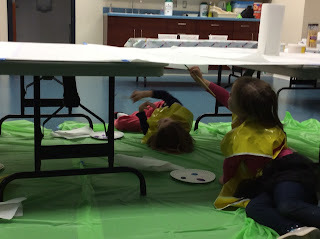 I hung craft paper between our storytime tables and let the kids choose a few colors of paint. I told them they could paint anything they wanted. Hard at work painting like Michelangelo. It was great to see the different techniques, some laid on their side, some sat right under the canvas, and some laid completely on their backs and painted. I hung up their masterpieces in the Children's department and let them know they could have their painting when they came to the next session. I am confident they will all return if they are able. Their wonderful artwork on display.